Volunteer medical science students of the Azad University of Medical Sciences held a protest in front of the regime’s parliament in Tehran, against the uncertainty of their situation, demanding determination of their status. A large number of volunteer medical science students rose once again on Sunday, January 20, 2019, to demand their rights. This has been one of several protests they have held over the past four months. 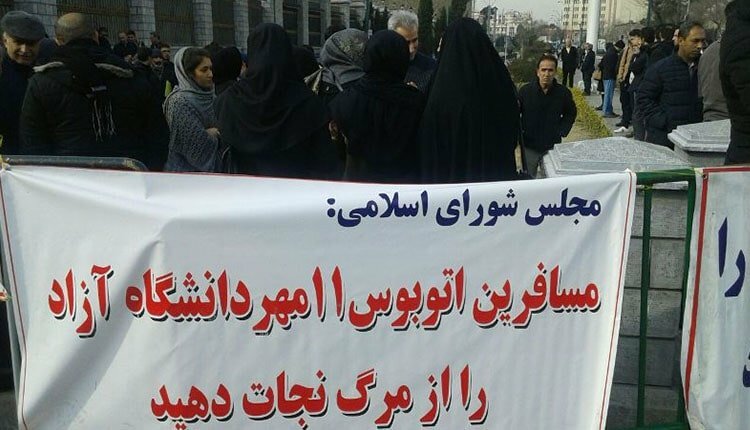 In another event on Sunday, January 20, 2019, a group of defrauded clients of the Shandiz Padideh Institute gathered in front of the Interior Ministry building in Tehran to demand their rights and the return of their assets. On the same day, a large group of buyers of registered vehicles from the Saipa and Iran Khodro automobile companies gathered in front of the parliament in Tehran, in protest to the high prices of the vehicles, lack of delivery of their purchased cars, and the failure to respond to their demands. Workers from Iran’s various factories and workshops marched in protest in Tehran’s Enghelab Avenue on January 19, 2019. In another event on the same day, students of the Razi University in Kermanshah protested against the university’s low quality food and lined up their food trays on the ground. On Friday, January 18, 2019, a group of people of Sistan and Baluchestan Province gathered on the Noor Bridge, five kilometers from the Zabol to Zahedan Road, and protested against the lack of completion of the Zabol to Zahedan Highway project.